I wouldn't have minded this! The only models you can currently buy of them are kits or handbuilts. http://cgi.ebay.co.u...:MEWA:IT&ih=023Don't particularly want to pay this sort of money for one though! Like the Aleko! Is that 1/43? Got any more pics? There's a few Arii kits in 1/32. Have a look on HLJ.com or search ebay for Arii "Owners Club" series. You won't get a 120Y kit in 1/32, only in either 1/24 or 1/28 and ALL the kits I have ever seen have been of the Japanese market Sunny Excellent coupe (KPB210) which isn't much like a UK car. We really need some models of 70s Datsuns, esp mainstream ones like the Sunnys & Cherrys! 1/28 120y, that would probably do, I supposed it is half ways there between 24th and 32, do you know where one could be purchased?! I'm afraid they are all obsolete now so unless you get lucky on ebay.com, your only hope is yahoo japan auctions via rinkya.com. Expect to pay a fair whack for a kit though... they aren't as cheap as they were five years ago when I was buying a few. I've got the Doyusha Nostalgic Hero kit of the Sunny coupe, and to be honest I wonder whether it's actually 1:24 at all, or maybe a bit larger. It's not a great kit whatever, aside from the usual shallow interior (due to the battery box) the moulding is quite thick, arches aren't well-shaped and the kit doesn't have that crispness of a lot of Japanese stuff. 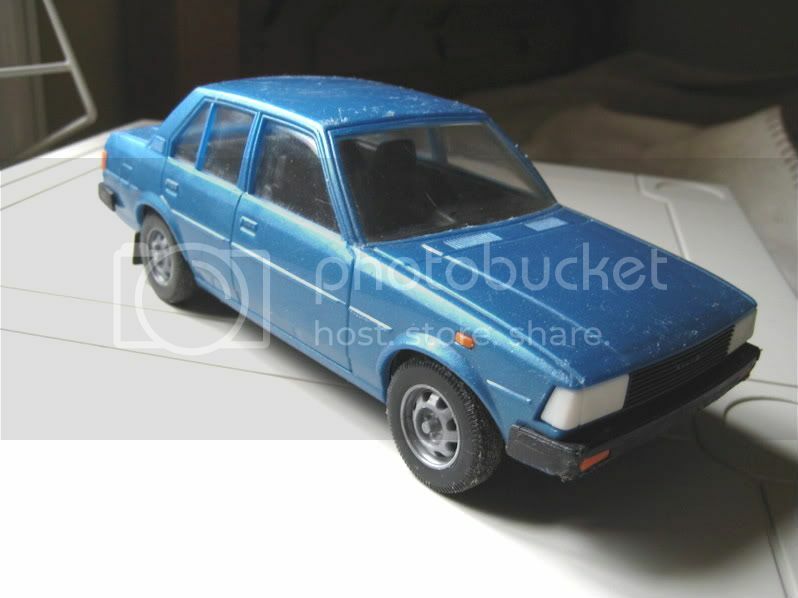 It's not one I get out of the box and instantly start daydreaming about how I'd build it, but I'm sure its day will come if I can think of the right wheels and maybe put some arch flares on it. I think the Doyusha kit is 1/22. The Eidai Grip kits are 1/24 I think but I've not seen one in the flesh and they are a bit pricey on Japanese auctions. I'm not a huge fan of the B210 so I doubt i'll be buying one any time soon! I had the 1/28 scale Otaki kit which was very nicely detailed and quite accurate but in a silly scale. I can't wait to add one of those (or several) to my collection. The car is clearly based on the BRE Trans Am 510 hence the spoiler and arches. makes sense seeing as it's BRE that made the car famous in the states. Hot Wheels actually make some neat little models amongst all the tat they do. They do have a tendancy to spoil things with big wheels and cartoonish proportions though. All the muscle stuff I got was fantastic in terms of proportions etc. Most were mild "Pro Street" type affairs with bigger wheels and nothing else, the odd flame sticker down the side on some of them, but nothing too garish! The modern stuff looked horrendous compared, sort of like an even more nightmarish version of The Fast and the Furious. Have to wonder who they make some of this for really, would nowadays kids be that bothered about old muscle cars? I want them to start knocking out Daewoo Esperos. I'd imagine the market now is mostly adult collectors rather than kids. The only kids i know who have toy cars are either car mad anyway and thus fairly knowledgable about cars or their parents are. HotWheels make some nice stuff,although as already mentioned,they also do some not so good cars.Matchbox are worth looking at too,although they're not so easy to find.In the last couple of years,they've brought out a Cadillac Hearse,Citroen DS,Mini Van,VW Camper,Alfa Sprint GTA,'60s Cadillac Saloon & VW Trekker.They also make some nice modern cars as well. I recently bought a pack of 10 Matchbox cars from an autojumble. Odd selection in it, including a Mini van and a lovely little Alfa GT (105 series?). Of course, it was "for my son", and in fairness I did give it to him and they make a nice addition to all of my old Superfast/Corgi Junior relics from my past that he plays with. I agree about the current issues of older cars that Hot Wheels do, they're nicely proportioned and I'll probably add a few to the carefully chosen garage I've just got for his birthday.I'm not fussed about keeping the modern stuff I buy in packs, I already have my 1970s Superfast collection. Perhaps I should stash one or two away though for my son, he might like to see them as they should have been in the same way I do with the old Superfast.Edit: The Alfa is probably the one 155V6 mentioned. Aha, Solido XM and 605 if I am not mistaken! Great stuff.I'd not seen the earlier Senator in 1/24th - I had the later ('83 model) which I used to put on the back shelf of my full-size one when I displayed it at shows!Who's the manufacturer of the E34 5-series? That looks absolutely bob-on. Minichamps (Pauls Model Art) I bought this off ebay, (As most of my models) for about Ã‚Â£10, the 7-series cost me about Ã‚Â£40. The Senator I saw at a toy stall and bought for Ã‚Â£4, made by "Gama" of West Germany, the black roof looks as if it has been painted by hand at some stage. The Citroen XM was the hardest to get, they pop up on ebay from time to time but end up going fot stupid money, one I bid on once went for Ã‚Â£60+ the one I have I got for Ã‚Â£30, but only as there is long crack in along the right-hand side of the window and has come apart hance its only displayable from one side. 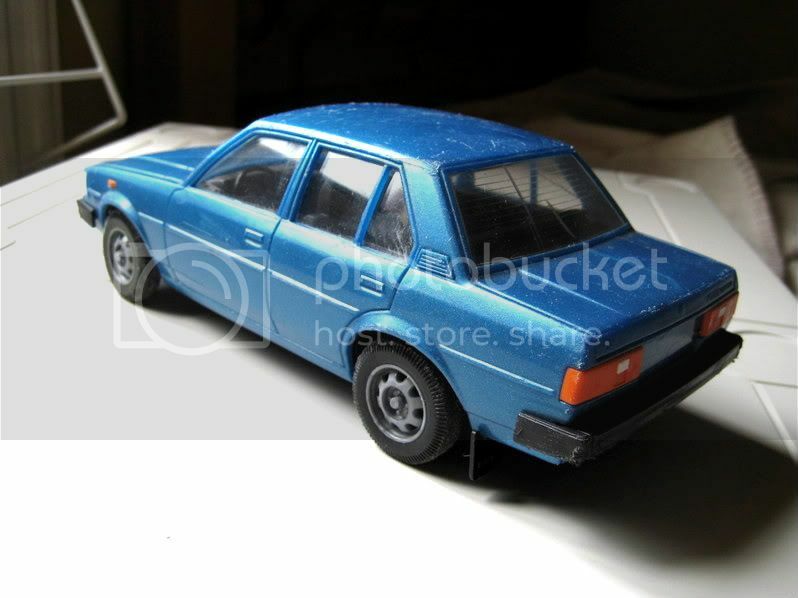 They also do a Renault 25 in 1/18 which I saw on ebay.fr once, pity the guy didnt have paypal otherwide I would have had it. I remember seeing that XM in the local model store around 1990, I did WANT it but couldn't stretch to the Ã‚Â£25 or so that it cost, I went for a 1/24 Granada Scorpio in gold which cost about Ã‚Â£12 I think then ruined its resale value by brush-painting the mirrors gloss black.